The last days of the long ailing Bal Thackeray turned into a raucous media circus. News channels, who thrive on sensationalism & vie with each other to 'break the news first' kept up a 24 hour vigil outside his residence Matoshree, much like vultures circling for their prey. The print media as well as instant pundits on social media went into overdrive and everything from wildly eulogistic pieces to near-abusive ones poured out in unceasing torrents. Amidst all this, based on my observations during my decade long stay in Mumbai (then Bombay ) and my two 'exposures' to the man, one 'indirect' and the other 'upfront & direct', allow me to share some of my observations and remarks about Bal Thackeray and his times, interspersed with brief details of the two 'exposures'. 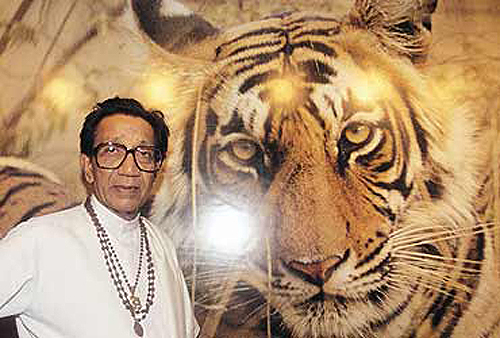 Bal Thackeray lived life like a king. 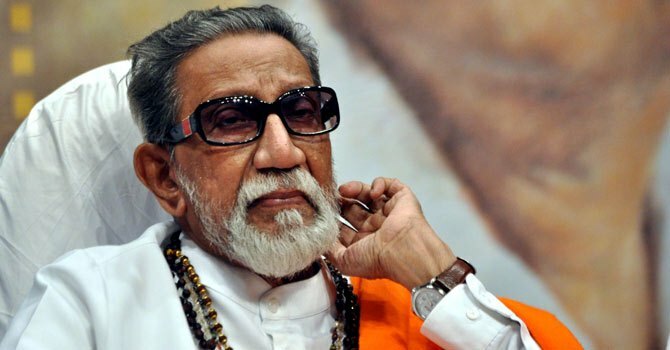 Feared, reviled and loved in turns, depending on one's point of view, he was the undisputed supremo of the Shiv Sena which he founded and ran with an iron hand for over four decades. At the grassroots level, the Shiv Sena's image was that of a party with a preponderance of toughies and goons who seldom hesitated to 'force the issue' when they needed to. 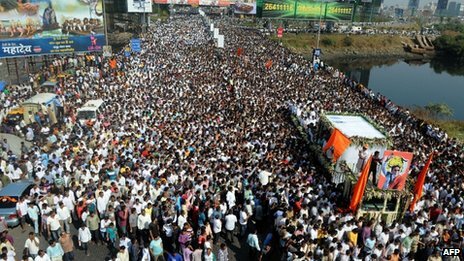 Since Balasaheb's word was law within the party, he soon came to acquire the image of a man who lorded it over Mumbai, more often than not through fear & intimidation. During the decade that I spent in Bombay, any bandh called by the Shiv Sena was an instant success and if one fell foul of the local Sena shakha, one had to look to the heavens for help because neither the cops nor the administration could help you in the least under the circumstances. Though they weren't in power at the time, the influence and the fear factor was akin to that exerted by the CPM in W. Bengal at the peak of their prowess during the 1970s. Yet, he could be quite pragmatic & business-friendly too. In many ways he was the Godfather to a number of Bollywood stars & personalities and the patron saint of sorts to quite a few Bombay based business houses as well. Bal Thackeray can be criticized for a no. of things but to his credit the man wasn't a hypocrite like most other Indian politicians. He made no bones about the fact that he ran his party like a dictator, believed in the philosophy of an 'eye for an eye' and also believed that, when it came to the crunch, fear was mostly the key to getting things done. In Mumbai, if he really wanted to make something happen (or not happen as the case may be ) no one could stop him from doing so. Let me narrate an instance from that time. Near my residence in Khar, a Durga Puja, largely organized & funded by the Bengali Bollywood crowd (Pramod Chakravarty, Shakti Samanta, R D Burman, Mithun Chakravarty etc.,) used to be held regularly in a local park. The whole park used to be taken over for about a week with the Puja and the various stalls selling food & other miscellaneous items which used to spring up around the periphery of the park. The organizers used to do things by the book and the regular crowd used to be a decent & civil one. One year we heard that the Puja possibly wasn't going to be held that year because the Municipal authorities were refusing permission to let it be held in the Park and the organizers had been unable to hit on an alternate venue & get permission for any such alternate site. The mischief-maker apparently was Sunil Dutt who had newly become a Congress M.P. from that area (he used to live in the vicinity, in Pali Hill) & who had apparently influenced the local authorities to hold back permission, on the grounds that the Park, owing to the Durga Puja, was effectively closed to all other people like walkers, strollers, joggers and kids & teenagers who used to play there, for about ten days at a stretch. Since Sharad Pawar was the Congress C.M. at the time & Sunil Dutt a Congress M.P. supposedly close to the first family, no amount of 'appealing' helped. Finally, several of the organizers, including Mithun Chakravarty, who, later in life, referred to Bal Thackeray as a father figure, went & met him. After they explained the circumstances, he apparently assured them that a Hindu Puja which worshipped the goddess of Shakti can continue to be held every year at the same venue and no one could quite come in the way of this happening. Everything worked like a charm thereafter. Sunil Dutt melted away from the scene and I believe the Municipal Commissioner virtually ran with the permit to the club president's house within a week's time & handed it over. Bal Thackeray was invited as the Chief Guest that year. He came and inaugurated the Puja & delivered a nice little speech as well. He was an articulate man, educated & fairly worldly-wise and had an impish sense of humour as well which was on display on occasions. Then, as now, I have often been critical of his politics and some of the stuff he and the Shiv Sena got involved in. But, in a land like India, where most politicians are venal and insincere and laid down systems more often than not are either dysfunctional or observed more in the breach, one does need a Bal Thackeray at times. During the '92 riots, when every other measure failed to quell the violence and the mayhem going on, a delegation which included top industrialists, prominent citizens and politicians went & met Thackeray personally & appealed to him to bring all this to an end. One doesn't quite know what exactly was discussed during the meeting but it is a fact that 24 hours later, the rioting had virtually stopped and the city had started getting back to its normal bustling self. Some years later, I was tasked by the Chairman of the company that I worked for at the time, to formally invite him to be the Chief Guest for the national launch of a service that we had planned to do in Mumbai. The Chairman had spoken to him already but some of us were tasked to hand him over the formal invitation and speak to him as well in this regard. The security was extremely tight and we had to get off the car some way away from Matoshree, as the house where he resided was named. After being frisked thoroughly and told about some do's & don'ts by his aides & assistants, we were ushered into a large room where he apparently met visitors & guests. There were several people waiting already for him and, after a short wait, he came in. He was pleasant & courteous with all those waiting for him and spoke to the people there by turns. He graciously accepted our invitation, told us that he was aware of the event already and confirmed that he would be coming on the day. Among the others waiting for him on that day, there were several VIPs. The Police Commisioner of Pune at that time was there and, just when we were leaving, Lata Mangeshkar, the legendary Indian singer, came in. He came on the appointed day. The Taj Intercontinental, Mumbai, where the service was being launched, had also laid out the red carpet for him. Tight security was in place and at the entrance to the convention hall which we had hired for the launch, metal detectors were put in place and all guests were required to go through them to get in. Bal Thackeray delivered a nice little speech, in the course of which he thanked our Korean partners, whose representatives were present, for investing in India. He also told them that he liked them because, to the best of his knowledge, Koreans were patriotic people and he liked all patriots. Afterwards he freely mingled with us and with some of the guests, chatting and sipping his Scotch. He surveyed the buffet laid out, had a light dinner and left soon afterwards. My lasting impression formed both during the time we met him at his residence, Matoshree, and afterwards during the launch event at the Taj, was of a supremely confident person with a certain charisma, who exuded the aura of being a powerful man but who could be pleasant and gracious when he wanted to. He wasn't in the least pompous and neither did he tend to talk down to people as some VIP politicians are wont to. Amidst the saturation coverage which ensued after he passed away, a friend asked me to enumerate the points of comparison between him and Jyoti Basu, the erstwhile strongman of the CPM in W. Bengal and the man who held the record for having been the longest serving Chief Minister of India. Here is how I see it. 1. Jyoti Basu was canny and shrewd and had a long-term political plan and strategy which kept him and his party in power for over three decades. Bal Thackeray, beyond his provincialism, parochialism and hatred of certain things, had no long-term strategy. 2. The CPM had an ideology at least initially and also had a number of men who helped define the ideology and the strategy of the party. Bal Thackeray had no such thing and, on any issue, what he thought or said was the last word. 3. Basu as Chief Minister took responsibility at least and even aspired to become the PM of the country. Balasaheb was a manipulator and a back-seat driver who preferred to have other men upfront who would do his bidding. Other than being the lifelong Chairman of the party that he founded, he held no official position, ever. In the final analysis, whether one liked him or loathed him, no one could ignore or be indifferent to Bal Thackeray. There were times when one quite agreed with some of what he had to say and admired his boldness in saying things the way only he could. And there were times when one felt that despite all his failings, one needed a person like Bal Thackeray amidst the chaotic and dysfunctional maelstrom of Indian politics. Above all, he was fairly unique both as a person and as a politician. R.I.P., Balasaheb.